Are you looking to drive more traffic to your website and increase revenue? Enterprise SEO is one of the best ways to do just that. Whether you’re looking for an agency that does enterprise SEO consulting or for the best tools to use, we’re here to help. In this, the ultimate guide to enterprise SEO, we’ll teach you how to find the best enterprise SEO agency for you and which tools and platforms we’ve found to be the best. So, if you’re looking for an enterprise SEO consultant, we’d love to work with you! You can get a free personalized SEO strategy review here. There’s absolutely no commitment. We’ll give you a free review of how to grow your business through SEO. If you decide it’s a good fit, then we’ll do business. But if you don’t, we’ll let you keep the plan and be on your way. There’s no standard definition of enterprise SEO; however, enterprise generally refers to a large business. SEO is the process of getting your website to rank at the top of Google and other search engines. Therefore, enterprise SEO is improving organic (unpaid) search rankings, and ultimately increasing revenue, for Fortune 1000 or global 2000 companies. These strategies tend to be high and low-level and have large teams dedicated to putting them in line with company goals. Make no mistake about it, traditional SEO and enterprise SEO are the same when it comes to the fundamentals. However, there are some key differences in both strategy and execution. In traditional SEO, you don’t usually need a huge team with people assigned to specific areas. Instead, your team will be much smaller, as each employee can focus on multiple areas. For companies using traditional SEO, increases in organic search traffic need to be fairly significant. In enterprise SEO, each digital marketing team member will have a very specific niche. They will dive down deep into their specified areas and look for ways to increase the bottom line. Because these companies tend to be so large and established, the increases in traffic tend to be much smaller as a percentage. Increasing your organic search traffic by a measly .02% could mean thousands of new visitors to your website. But simply having a very big company doesn’t mean you need an enterprise website. What matters more is how many pages and products or services your website has. This is one of the reasons you would need a niche-specific staff or agency to manage your website. A good example would be a large cell phone service provider company like Verizon. Verizon has specific product pages for every phone, tablet, and other devices they sell. While Verizon is an extremely large company, it’s actually the number of products they need to advertise that make them need enterprise SEO. As a side note, think of how difficult it would be for your SEO team to manage thousands of site pages. Without the proper tools, that would be an incredibly daunting task and require a huge team. The burnout would be outrageous. That would be like trying to build a house with only a hammer, nails, and wood. Sure, it could be done, but with the proper tools and guidance, it would be done better and faster. Would your company be described as a Global 2000 or Fortune 1000 level? Do you currently, or could you, have a robust team dedicated to specific areas? Does your market span different languages, regions and countries? Would an increase in your online traffic by a very small percentage translate to hundreds of thousands of visitors? Does your company have thousands of products or services to advertise on your website? If your company answers yes to most of those questions, you probably need an enterprise SEO company. 54% said creating high-quality content was their most effective SEO strategy. So, while the vast majority of enterprise companies have success with their SEO campaigns, the majority struggle to hit their objectives due to employee skill. Part of this is due to how granular you need to get with each of your specific pages. And with thousands of pages about each of your products or services, that can be extremely difficult. Even with a large SEO team. Virtually every marketing strategy, no matter how big or small, needs a tool to track the progress of its website and pages. However, this is even more difficult for an enterprise company. For example, a company like Verizon will have to manage thousands of pages, their content, and track their ranking on Google. Here are some tips from Enterprise SEO Platforms: A Marketer’s Guide on how to do that. Several tools on one interface: Managing all the tasks you perform for a robust website is difficult. Instead of using a platform that only tracks reporting, tasks or user permissions, a single enterprise SEO platform can do all three. The efficiency of global operations management: A common struggle for enterprise companies can be managing website issues related to different languages, regions, and countries. Solid SEO platforms are built for this and can diagnose and tell you what to fix on pages and platforms, no matter how big or small. Staying up to date with search engines: With all your SEO team has to manage, it’s extremely helpful that enterprise SEO software will help you be on top of things with all of Google’s updates. These vendors have teams that solely keep track of ranking factors and algorithm changes, and that gives you more time to improve the rankings of all your pages. Automated reporting in almost real time: If you’re trying to compile information in spreadsheets and manually update them, stop. There’s a better way. Many of these platforms will not only help you do things like keyword research, but they’ll also automatically update the list over time. That’s a huge time-saver, and it prevents you from having to do the work over and over again. Link analysis: Acquiring solid, relevant links to your website is probably the best way to improve your overall ranking. Similarly, you don’t want bad links pointing to your website. These tools help you track all of that. Keyword research and rankings: To have a successful SEO strategy, you have to start with good keyword research and then track your rankings. International enterprise rank tracking: Businesses that span multiple countries have to be able to do more than track rankings in the US. If your business has thousands of pages that span regions, languages, and countries, you need to be tracking each of those pages in those areas. Social media signal tracking: While social media doesn’t directly affect your SEO, it should still be a key part of your strategy. Tracking is a huge aspect of any digital marketing strategy, especially enterprise strategies. Third-party data management and integration: Just about every SEO campaign, traditional or enterprise, should leverage third-party sites. But tracking which ones you’ve signed up for can be difficult, especially for large companies. Having an enterprise SEO platform that not only manages, but also integrates third-party data for you will be incredibly helpful. So what? How exactly do these tools benefit your enterprise business? While there are a lot of enterprise SEO platforms for you to use, let’s go over a couple and some of the ways they can make life much easier for your enterprise SEO team. Keep in mind that we at Sure Oak aren’t saying your company should use these exact tools. Instead, we just want to show you real-life examples of the massive benefits your company can have by using these tools and others like them. It should be noted that the enterprise SEO platforms mentioned below do much more than the examples we’re giving you. These are just examples of how much easier they can make your day-to-day. Also, if you’re looking for an agency to do enterprise SEO for you, make sure they’re not only familiar with some of the big-name platforms, but that they also have experience using them. A stellar enterprise SEO company will be able to give you concrete examples of how they will use specific SEO tools to benefit your company and grow your bottom line. If they can’t, you should think twice about hiring that agency. Conductor is a platform tool that gathers insights from all your enterprise SEO efforts. These insights help marketers create and optimize their content so it drives visibility and revenue, addresses customer needs, and defeats competitors’ digital marketing tactics. The tool also offers recommendations of what to do based on what your customers and potential customers are searching for. In the same vein, Conductor has the ability to identify who your competitors actually are, deconstruct their strategies, and attract their audiences to your business. Finally, Conductor also allows you to track keywords and your market share by metrics like region, result type, device, and more. BrightEdge is a tool that helps enterprise companies with their content marketing and keyword research. In BrightEdge, you can list the pages that you want to optimize, and it will consistently give you recommendations on how to get those pages to rank. You can also set it up to send you frequent emails with keyword suggestions. Not only will it tell you what keywords to put in your title tags, heading tags, and meta descriptions, but it will also help you optimize the content on the page. If you need help coming up with keywords to rank for, this platform will come up with the keywords most relevant to your business. In addition to this, BrightEdge will help you find the keywords with the highest buyer-intent, periodically update your keyword lists, help you collaborate with your paid search ads to maximize effectiveness, and more. BrightEdge also has a team dedicated to training you on how to use its platform and will give you frequent training on how to use it. While it can absolutely save you time in the areas above and more, you and your team need to be willing to learn how to use it. SEMrush is another enterprise SEO platform with a lot of awesome capabilities for your business. We won’t go into all of its features, but some of them include keyword research and management, assistance with content ideas and creation, competitor analysis, and getting backlinks. For example, companies both large and small tend to struggle with content creation. Yet, they know it’s vital to continually come up with relevant blog posts and static website content. In SEMrush, you can type in your URL and it will show you your competitors. If you already know who your competitors are, you can type those in and it will tell you all of the keywords they’re ranking. It will also tell you all of the blog posts they’ve done, which ones performed really well, and who linked to them. This is all invaluable information. You can then write better versions of those posts and ask the companies that linked to them to link to yours. And to make things even easier, SEMrush will even help you write the content. As you’re writing, its SEO Writing Assistant tool will help you with every aspect of your content writing. Think of how much time that could save your team – not to mention how much more effective that makes them at their jobs. Say goodbye to ever running out of content ideas or getting backlinks! Ask yourself: How does using this tool increase your company’s bottom line? A software tool might have the latest and greatest technology, but the point is to increase your profits. Make sure it plays into your strategy and goals. Ask yourself: Will this solve any problems? If so, which ones? Will it cause more problems? No matter how great a tool, there’s almost always something it complicates, even if it’s only a temporary complication like training your team to use a new product. What you have to decide is if it’s worth it. Most of the tools we’ll get into will be well worth it. But you still need to identify exactly what problems each tool solves and creates. Ask experts in your industry about it: Sometimes, you just need to ask around and search on Google. What are the best companies in your industry saying about this software? A quick search can save you from a lot of pain and help you choose the best product. Research and thought leadership: During your search, a high-quality enterprise SEO firm will come across as a thought leader in its space. While you’re looking around, do you see articles and blog posts from that company on the subject it’s supposed to be the best at? Is it investing in research? Does its content help educate the community? Everything mentioned in this section can also be applied when looking for an enterprise SEO agency. If you’re looking for an agency to do your SEO, use those same questions in that search. We can answer each of them for you with specificity. Make sure whatever agency you’re considering can too. Do we have the proper personnel? If you want to succeed in enterprise SEO, you first need employees who can use and implement those tools. Having an online marketing team to use those tools will increase effectiveness and efficiency. It’s generally very difficult to attribute increased revenue to organic search. That makes justifying the SEO budget hard to do. However, enterprise SEO tools will help keep costs down and improve the team’s effectiveness. Have the chief executives bought in? Enterprise SEO platforms are usually pretty expensive. This means you need the chief executives to be on board and agree to what success looks like. Before you go full-boar into this, try doing some pilot projects first so money isn’t wasted. Are our technological resources enough for this? Your enterprise SEO strategy won’t succeed unless you have technology capable of carrying out the strategy. For example, if one of your issues is speeding up your website’s load time, you’ll need a fast server to accomplish that task. Who will take ownership? Someone at your company needs to run and manage enterprise SEO. It usually becomes the responsibility of marketing, IT or an online marketing agency. In the ideal situation, it will go to the team or agency with the budget and passion for it. Can we train our staff on it? If you’re doing enterprise SEO in-house with a platform to go with it, it’s critical your staff is trained on it and understands how it integrates with your current SEO strategies. A good enterprise SEO agency will already be trained on how to use such tools. Similarly, a good agency will also be able to explain how such tools work with your goals. Do we have a system in place for tracking, measuring, and reporting results? You need to know what your key performance indicators (KPI) are. What objectives are you trying to achieve? Time on site? Increased leads? Having goals in mind will help you know which enterprise SEO tool can best help you. How will we measure success? In order to justify the cost of enterprise SEO, you need to have a goal. Which KPI will you measure? What are our expectations and are they realistic? Traditional SEO is a slow process and enterprise SEO is no different. It can take six months, or sometimes longer before you start seeing results. Similarly, if an enterprise SEO agency promises big ranking improvements much faster than that, you should probably stay away from that agency. What’s your process to calculate keyword search volumes? Can your system track searches, website pages, and visits with volume in the millions? Does your system support and track international search? How good is your platform at reporting and tracking search results? What are your reporting options? Are they flexible enough to be tailored to this company’s needs? Can you give us actionable reports? This is important because the stakeholders at an enterprise firm will need SEO data. Can your system provide my staff with the meta information? Does your system collect it? Does your system have the capability to manage tasks and workflow and coordinate marketing across all of my respective channels? What kind of support does your company provide? Will there be extensive training to ensure my team knows how to effectively use your platform and that it’s successful? How will you determine if it’s successful for my company or not? Are you coming out with any new features soon? (If not, that’s a bad sign.) If so, when do you expect them to come out? How would those features benefit my company? In summation, an enterprise company’s website will have thousands of pages, and having the right platform can make your staff a lot more efficient and prevent burnout. But, before paying for an enterprise SEO platform, it’s critical that you’ve established a need for it, how it will fit in with your strategy, and where you want it to take you. If you don’t know where you want to go, you’ll end up somewhere else. You and your staff, including the executives, have to be all in. When you’re considering potential vendors, check to make sure they’re experts in their space. And make sure they’re educating their space through killer content. If they aren’t, stay away from that vendor. If you’re looking for enterprise SEO services, the Agency you hire should be able to articulately tell you how they’ll use such platforms to increase your organic search and how that will benefit your company. It isn’t enough for an agency to say it will bring you more traffic. What’s their plan of attack? You need to know how that brings you more sales. A really good agency will be able to give you a detailed plan. 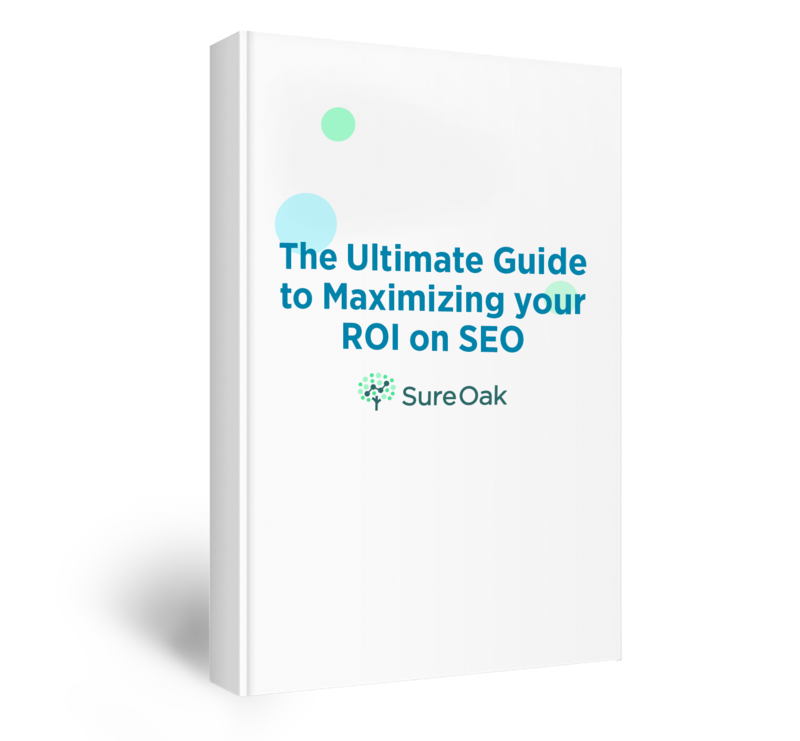 At Sure Oak, we’ll give you a free personalized SEO strategy review explaining how we can improve your organic traffic and increase your bottom line. Make sure the enterprise SEO agency you’re considering can do the same.